The ban extends e-cigs to the same places as the state's smoking ban. It would also mean that customers can't vape inside stores that cell the e-cigs and the liquids that go inside them. "There should be some sort of permitting that we should be able to apply for. If you can have a cigar bar or a hookah bar we should be allowed to vape in our vape stores" says Matthew Murphy, owner of Lakeview Vapor. Murphy says many customers sample flavors in their vape machines before purchasing them. Customer Todd Hagenkord says that is often how he tries a new flavor. "It's nice that you can taste it because you drop X amount of dollars on a bottle of juice and you go home to taste it and once you crack that seal and it tastes terrible -- guess what you're out the money," said Hagenkord. 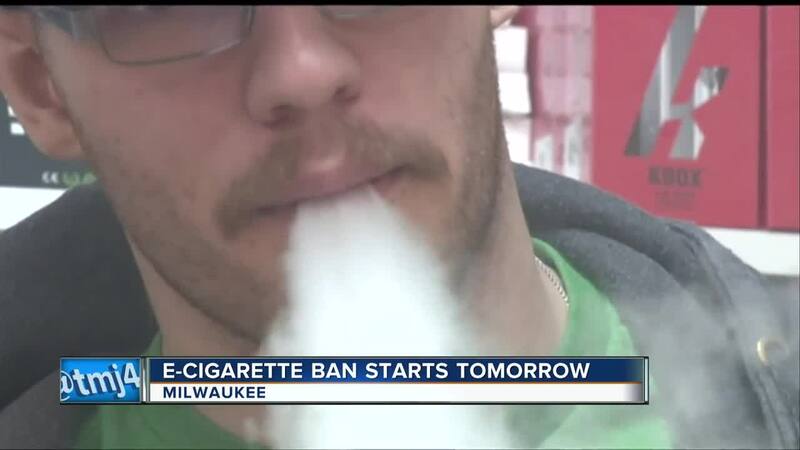 Milwaukee follows Greenfield, West Allis and South Milwaukee in adding the ban. Murphy doesn't believe it will hurt his business. He says, "There's other ways of trying to get a flavor of the e-liquid by tasting it or even just smelling it... I don't see it putting a dent in our sales or anything it doesn't matter."